Annoyed with the sound of rainwater gushing through your home's downspouts? Consider a rain chain—a beautiful and functional alternative to traditional, closed-gutter downspouts that creates an artistic statement and a Zen-like aura. 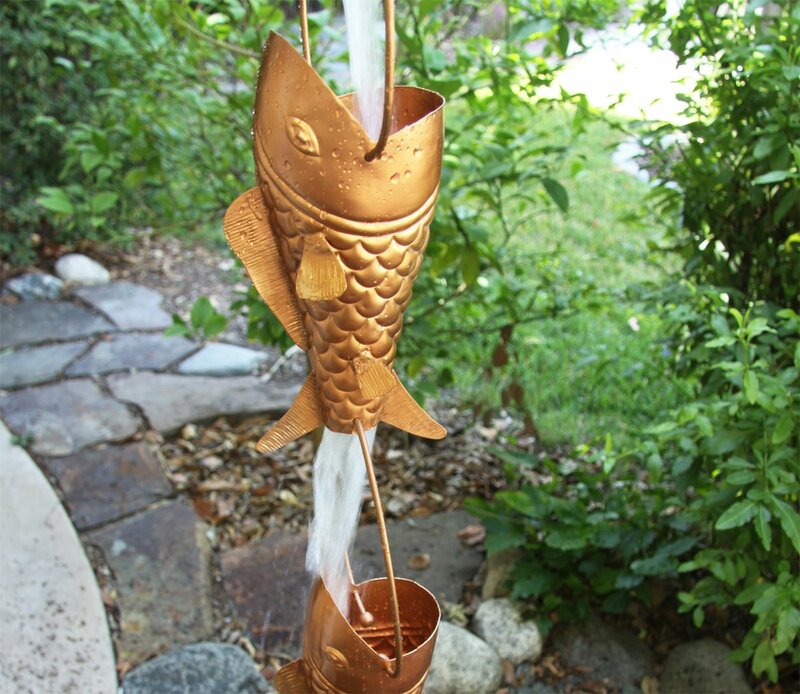 Above: artful Koi fish rain chain. Glimmering glass from Teri Welsch. Any fan of mid-century culture (or linguistics) could tell you that the rain in Spain falls mainly you-know-where, but only in the upcoming winter/January 2017 CA-Modern magazine will you learn that rain down a chain falls any way but plain. That new CA-Modern won't be out for a month, but here's a sneak preview in PDF, all about rain chains: 'Just Add Water' by Tanja Kern, CA-Modern's home improvement editor. Tanja's story offers ingredients for replacing your everyday rain gutter downspout with a recipe that will bring about a more soothing yet entertaining outdoor environment in the rainy season. The story highlights 12 different designs of rain chains, a creation popular in Japan that is catching on with American modernists. Prices range from $50 to $657, with designs drawing inspiration ranging from figures in nature like leaves or fish to recycled wine and beer bottles. Reasons given by their creators for their popularity extend from simple pride in one's home to appreciation of the musical quality of rainwater. "People have become more house-proud, and they want to do things without spending a huge amount of money," observed Mona Verma, vice president of Chino-based Monarch International Inc., which sells several models of rain chain, including the Kioshi design (PDF chain #5) profiled in Tanja's story. The Kioshi features a copper chain linking a series of five copper cups. Several of the profiled chains are made of bright copper, which of course will not stay bright indefinitely while exposed to the elements. "It oxidizes, it doesn't tarnish. It develops a patina," Verma conceded while terming copper a "biofriendly" material. "But still, the inherent value of copper never changes...It's just a good, natural material to use." "The Kioshi is a new introduction for 2016," she said of the Japanese-style design profiled in the magazine story. "Our most popular ones are the Lotus and the Hammered Cup," she added, noting of the latter, "All the designers buy that one." In a similar vein, the designer of another rain chain, Ken Au, commented in an email interview, "I think people who have an eye for art and appreciate beautiful aesthetics like the rain chain." Au, a craftsman based near Vancouver, Washington, builds his chains out of sections of reclaimed copper pipe (PDF chain #6). His main business, however, is restoring antique, vacuum tube radios. Two other chains in the story are fashioned by Arizona-based artists, including Teri Welsch. Welsch creates her custom chains from chips of colored glass (PDF chain #7), assembled by special order after she consults with the individual customer. 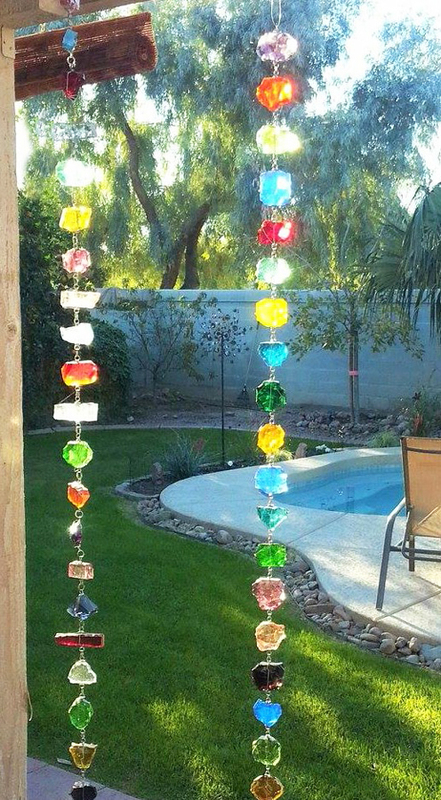 The other Arizonan, Jenna Ekwall of Cottonwood, makes two models of rain chain out of recycled wine bottles. She said the shape of bottles from differing wineries provide different form for her creations. "Sutter Home [bottles] give it more of mushroom top, which is better for rain chains," said Ekwall. Alternatively, she said, a Woodbridge bottle "gives it more of a fluted cone effect."